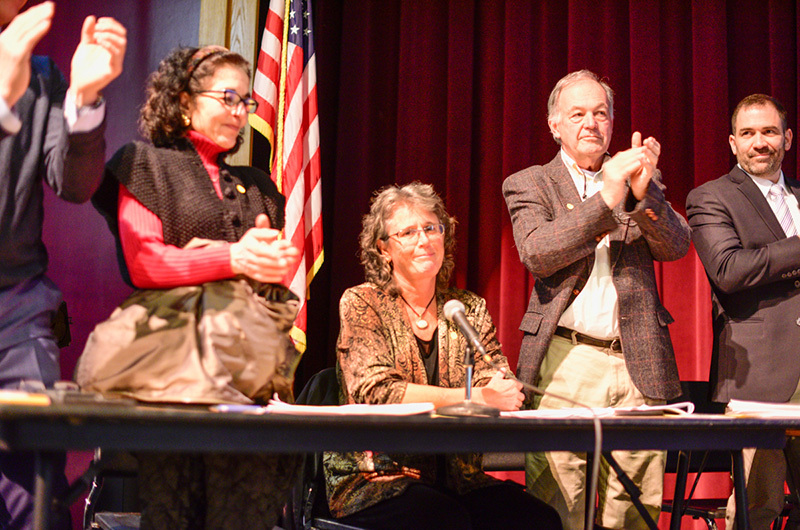 Selectman Kathy Burton (center), who is not seeking reelection, received a warm tribute Tuesday night. Oak Bluffs voters Tuesday night took a first step toward banning moped rentals, signed off on a laundry list of capital improvement projects, allocated $63,000 in town funding for regional social services and approved a $30.3 million budget, the largest in the history of the town. 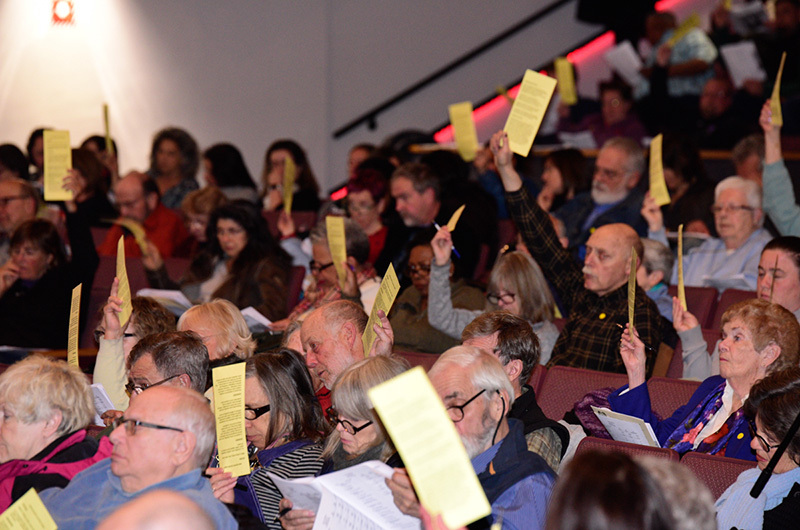 Held at the Performing Arts Center, the meeting saw 272 voters turn out to mark their votes by raising yellow cards. Moderator Jesse (Jack) Law 3rd presided and most articles zipped through with little to no discussion. The meeting kicked off with a standing ovation for Kathy Burton, chairman of the selectmen who is retiring this year. “She’s the only level-headed one in the group,” quipped longtime selectman Greg Coogan. The long-running quest to ban moped rentals in town saw a big step forward with the passage of a home rule petition that could ultimately give the town the authority to enact such a ban. The petition now goes to the state legislature. If it is approved, it will return to the town for a second vote, likely next year. There was no debate on the home rule petition and the article won quick, unanimous approval. Money is tight this year in Oak Bluffs, a theme that surfaced more than once during the meeting. 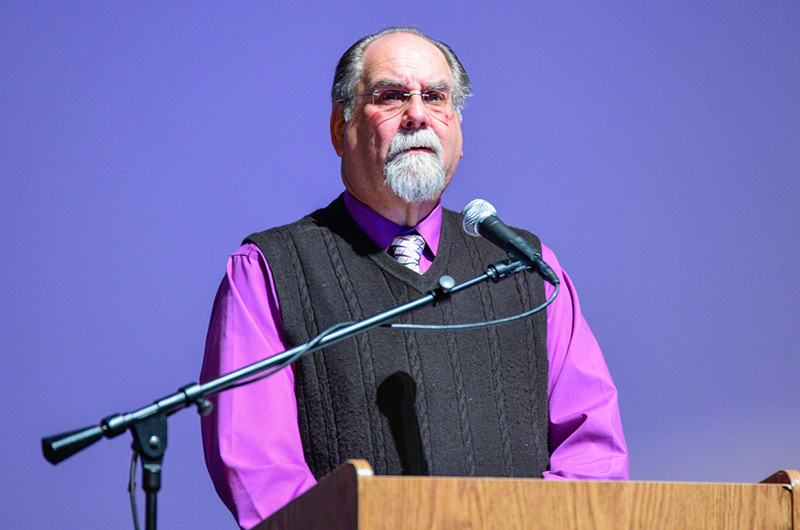 During discussion on the budget Ron Mechur, a former town assessor and longtime professional property appraiser, was among those sounding an alarm over the need to find new sources of revenue. “We’re all shareholders in this company. We need to find another way to get revenue,” he said. The town was facing two Proposition 2 1/2 override questions on the ballot in the annual election Thursday: a $275,000 general override and a debt exclusion question for $350,000 for the design phase of a school roof repair project. The roof project passed on the town meeting floor. Bill Engler stood to speak in favor of the article, calling it a proactive step. Another article that passed quickly with nearly unanimous approval was for $600,000 to put toward a major environmental improvement project around Sunset Lake. A new set of regulations for park and beach use was also approved as a town bylaw. Voters also overwhelmingly approved $250,000 for renovations at the harbor master facility. The most hotly debated issue of the night centered on a request to devote $40,000 to regional human services, with selectmen in charge of appropriating the funds. The article had been placed on the warrant by the selectmen as an alternative to combined requests for some $70,000 to help pay for substance abuse prevention education, First Stop, the Healthy Aging task force and the Core program of Martha’s Vineyard Community Services. 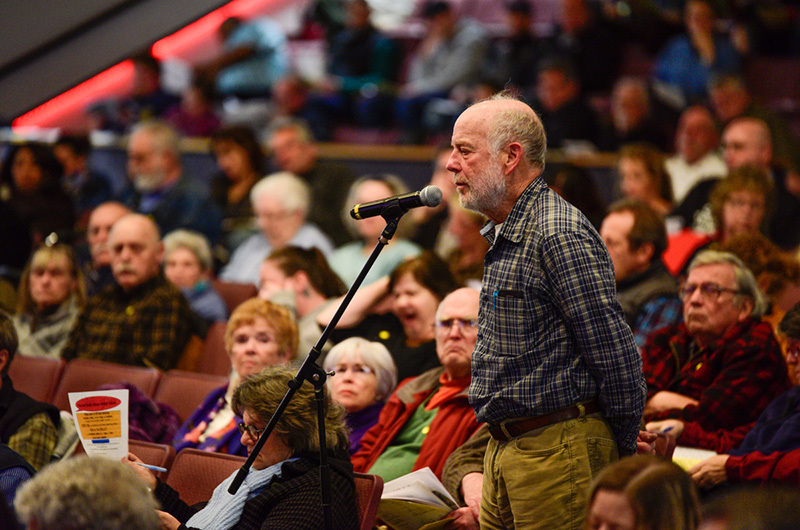 On the town meeting floor some argued that the reduced amount would shortchange critically needed services. “I think the selectmen have taken voters’ rights away from us,” said Christine Todd, a Dukes County commissioner and executive director of the town business association. But town administrator Robert Whritenour said Oak Bluffs already pays a higher share than any Island town for human services, and limiting funding was necessary in a year of financial constraints. In the end the spending was increased when Walter Vail moved to beef up the article by adding some $23,000 from an earlier article to build beach stairs that had been postponed. The total town contribution for social services grew to $63,000. The only other article that sparked debate was a request for the town to contribute $100,000 toward three affordable housing duplexes in Vineyard Haven. Many echoed the need for more affordable housing on the Island, but wondered why the town wasn’t building more in Oak Bluffs. The article passed after about half an hour of discussion. A petition brought by students from Island schools to ban the release of helium balloons was approved after impassioned speeches from a few students. “It’s our beaches, ocean, and wildlife, so let’s do something about it,” Sam Fetters, a student at Oak Bluffs school, told the crowd. Voters rejected the final article of the night, a request from the county sheriff for almost $100,000 in funding for the cost of the Dukes County emergency communications center. 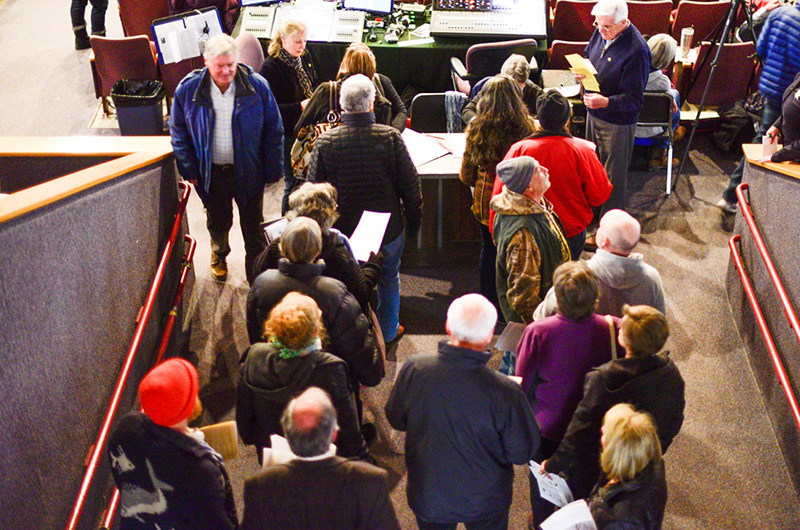 The meeting ended just before 9:45 p.m., the first to finish of the four town meetings Tuesday night. More photos of the Oak Bluffs town meeting.